It’s worth explaining a little about booting Mac OS on a hackintosh. A bootloader is required to get the process started but modern bootloaders are evolving to do much more than that. The Chameleon V2 bootloader that I use offers a graphical OS selection screen as well as the option to load required files from an Extra folder on your hard drive. In the past for Leopard I installed my required kernel extentions (kexts) into the System/Library/Extentions folder using kext helper or OSX86 tools. Every time a system update is installed the new files needed to be replaced with my older modified versions to get sound etc. working again. By using an Extra folder the bootloader will use these instead of the ones in System/Library/Extensions (S/L/E from now on) meaning you can install system updates without overwriting your kexts and other required files. I chose the first method listed above, using the Chameleon bootloader with a hidden EFI partition. This hidden partition is automatically created whenever you format a Disk using Mac OS, below is a screengrab from Disk Utility running on my hackintosh. The partition of interest is disk2s1 on the 500.11Gb drive. This is where the bootloader creates an Extra folder, the destination for the modified kexts as well as several other files I will cover later. You could have an Extra folder on you Snow Leopard partition (snow in the image above) but I like the idea of a hidden partition that is not normally accessible. 1. 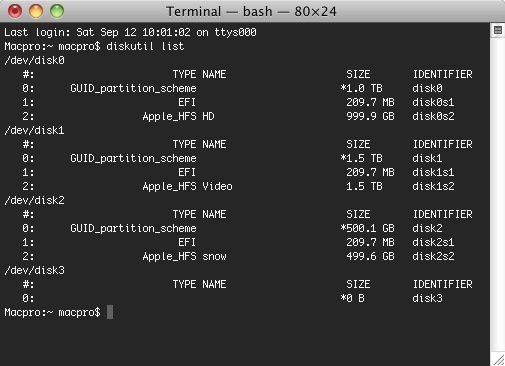 Use Disk Utility from the existing 10.5.8 installation to create a single partition on another hard drive, using the GUID partition table. Once you have selected the options, complete the installation. Unzip/tar the files to a folder on your desktop, then run Chameleon-2.0-RC2-r640.pkg. Before going any further it is important that we protect ownership on the EFI drive. Show Info for the EFI drive, then ensure the Ignore Ownership on this Volume box is NOT ticked. 5. On the EFI drive are two things, a boot file and an Extra folder. 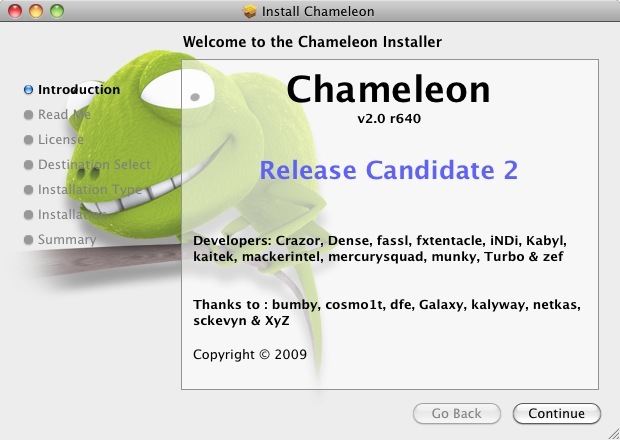 Replace the boot file with the one we downloaded from Insanelymac earlier, the file was called Chameleon_RC3_boot.zip. Then copy into Extra/Extension all the kexts downloaded earlier. 6. Some other files need to go into the Extra folder, depending on how you are patching your install for sound/GFX/ethernet. I use a modified com.apple.Boot.plist file for graphics and ethernet under 10.5.8, so I copied this into the Extra folder on the EFI drive. A dsdt.aml file is recommended which is patched to fix a bug in Snow Leopard that corrupts your motherboard CMOS. Many guides already exist for this, such as the ones at Infinitemac (step3) or Insanelymac. I used the iaslme tool downloaded from mediafire to decompile the dsdt.aml file from my 10.5.8 install, fix the bug in textedit then compile the new dsdt.aml. It’s fairly straightforward, I will write a guide if requested. While I was fixing the CMOS bug I also patched the dsdt file for sound from the 889a audio on my motherboard following the guide by aschar1 at Insanelymac. The 889a.kext from the guide was added to the EFI Extra/Extentions folder. Copy your UUI then right click on AppleSMBIOS.kext and select Show Package Contents. In the Contents folder is an info.plist file that can be edited with textedit. Search for UUID-key as shown below and replace the characters between <string> and </string> with your UUI. Save the file and repeat for PlatformUUID.kext searching for <key>PlatformUUID</key> this time. Reboot the system and select the snow Leopard Drive. You should see the Chameleon bootloader screen, select the Snow Leopard drive and allow to boot. There are differing opinions on using flags on first boot, many people recommend using -x32 to force 32 bit mode. I didn’t use these and have seen no problems from not doing so but your requirements may vary. The Mac OS setup wizard runs on first boot as usual, My first mistake was to import my user account and applications from 10.5.8. After much testing I found the user account was fine to import either during initial setup or using the Migration Assistant. The applications caused ethernet to stop working so I have now reinstalled my required apps and used this as an opportunity to not install those that don’t get used. By using the hidden EFI method you can erase your Snow Leopard drive and reinstall the OS, and the boot files/kexts are still in the EFI partition. I have also upgraded to 10.6.1 using the downloaded installer and have had no problem so far. 9. Just a couple of things to do once Snow Leopard is running. 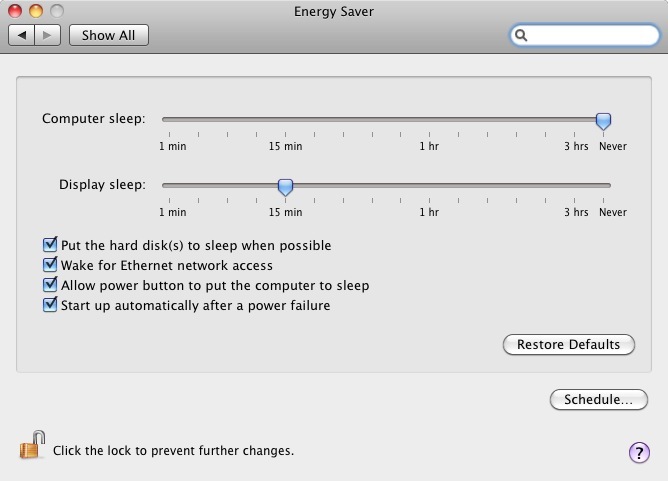 I could not get sleep to work, so thanks to KELVIN88 in the Insanelymac forums for reminding me to select ‘Start up automatically after a power failure’ in the Energy Saver System Preferences pane. was fixed by reinstalling the BSD.pkg on the Snow Leopard disk from Snow Leopard. This package is in the same directory as the OSInstall.mpkg used to install Snow Leopard earlier in the guide, so follow those instructions. Snow Leopard has so far been very well behaved on my Hackintosh, so the next step it to install on the other two machines. The HTPC is mostly used for running the Plex media centre which currently has some issues with Snow Leopard, so that install is on hold until Plex is updated. The Atom server hard drive contains all my shared files so I am looking to upgrade that drive. I use the Carbonite backup service and so far have 42Gb backed up off site so I’m not risking a fresh install being seen as containing new files. It took 10 days to backup 42Gb so I really don’t want to do that again. Another post will be made once that is done. Please leave a comment if you find any errors or typo’s in this guide, it took around four hours to write so I’m off for a rest. Happy hackintoshing. Thanks! Very thorough and understandable. Which version of the P35C-DS3R are you running? I’m running v1.1 with BIOS F12. If yours is the same, do you mind sharing your working DSDT file? My Motherboard says it’s V2.1, so you are best compiling a DSDT to suit your board. I have used the DSDTgui tool from pcwizcomputer in the past, this works great under Leopard but I haven’t tried it on Snow Leopard yet. Hey man …. this guide is simply fantastic! So well written and accurate! I guess i’ll try it since incidentally we got almost the same hw, as MB i have a P35-DS3P which is more or less the same as yours. I have a question about graphics card: i’m going to swap my 2600 pro PCIe with a 9800GT just like yours, did you have problems with QE/CI? How did you manage it? EFI strings? Thanks, basshead. I’ll try the DSDTgui tool. Thanks for the great guide! This is incredible help for me (like your previous guides) as I have almost the exact same hardware (same mobo rev2.1, same cpu, same amount of RAM, even had a 9800gt until it died last week). More info about making the DSDT file would be appreciated, as I am totally lost on the subject and,like Derron, am tempted to ask you for a copy of the file you used successfully (as I´m running more or less the exact same hardware). Anyway, the guides are great, as are your posts on how you go about updating your hackintosh. A few points that maybe you want to add to your guide. mount_hfs /dev/disk2s1 /Volumes/EFI <<<< This fails – mount_hfs: Invalid argument, even after reformatting the drive. "I believe your EFI partition is blank at the moment (ie, unused) and that explains everything." 5) diskutil eraseVolume "HFS+" "EFI" /dev/diskXs1 – now, be *VERY* sure this is the correct drive. this will format the EFI partition as HFS+. (NB After erasing it will try to mount it, but will fail with "Could not mount disk0s1 with name after erase". Ignore this). After about an hour I gave up googling alternatives and I mounted it, and formatted using the exact same process, using my wife's SL based MacBook, which worked fine. After I unmounted and reconnected to my MBP it mounted again. From here I was able to mount the EFI partition as HFS+ and rerun Chameleon with the EFI partition instead of the Snow partition as target. I'm at Step 6 now, and am working on a new disk which I will install into my server at home. Had I read the instructions fully I'd have realised that I should have brought my S/L/E folder from my Kalyway install so to copy my com.apple.Boot.plist file and my dsdt.aml file. Step 6 is actually many steps – for clarity it would be helpful to split it up. I hope my comments are helpful! Further point: users may get “Install Failed” if they don’t select the same set of options in Step 2. 1. I didn’t end the Snow Leopard installation step with ‘Click Install’ because this isn’t intended as a guide that lists every button click. No subsequent part of the guide says ‘Click Install’ so I thought this was not necessary. The step is intended to show where to install to, and what installation options are available. Since it appears to have caused confusion I will add a ‘complete the installation’ instruction. 2. If you look at the screenshots of the chameleon installer, you can’t select an EFI partition as it isn’t mounted or visible. 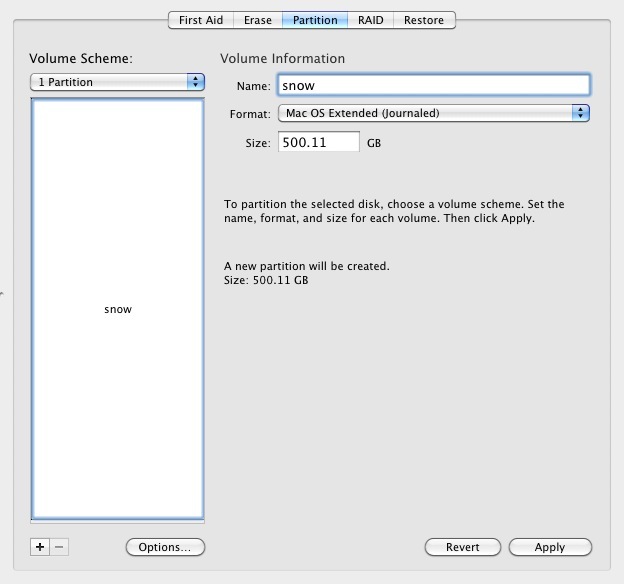 If the EFI partitions were shown there would be three of them in the guide, one for HD, Video and snow as Mac OS creates the EFI partition automatically. 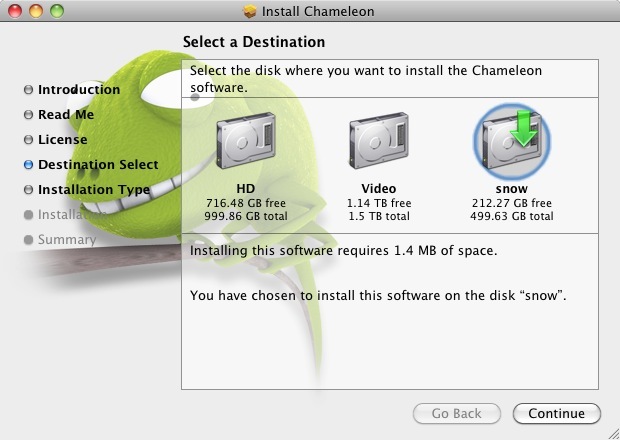 Selecting the snow partition as a destination for chameleon actually installs to the EFI partition before the snow partition, this has worked fine for me several times. I have used Chameleon Standard and Chameleon HFS and both have worked. I’m not clear on the difference at the moment, this is one of the many areas I am still learning. I think I saw a mention of the ‘Invalid argument’ error on Insanelymac, I got this at one point but unfortunately can’t remember what I did to get around it. Did you untick the ‘Ignore ownership on this volume’ box? Worth another search of Insanelymac, I vaguely remember there being a fix or explanation mentioned. You may have to use the terminal to delete files put on the EFI partition by chameleon. I didn’t go into every last detail about this as the guide would be twice as long and would have taken 8 hours to write instead of 4. Also, a certain level of knowledge is required to install on a hackintosh and basic terminal is something I consider essential knowledge. After installing chameleon my Extentions folder was empty. The extentions you ended up are not needed, I think these are for Leopard so may not work with Snow Leopard. 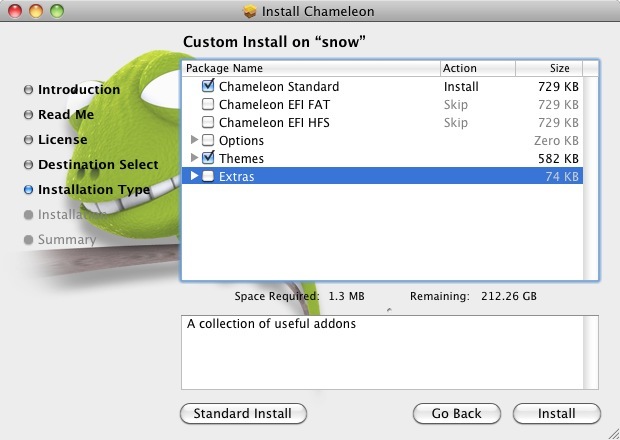 If you look at the final chameleon screenshot of step 3 it shows the Extras option is not selected, this is the one that installs the kexts you have. The screenshots were shown as a guide to what needs to be selected. I also have a screenshot in step 8 that shows my kexts, some of those you have are not in the screenshot so are not part of my install method. 3. 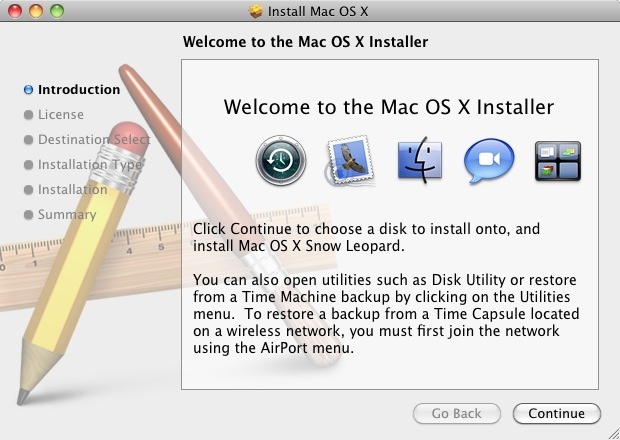 Step 1 starts with using an existing Leopard install (10.5.8 in my case) to install Snow Leopard to another hard drive. That means I still had my 10.5.8 install to go back to for certain files I used on Snow Leopard. I strongly recommend reading any guide through several times so you have everything needed before starting and a good grasp of the steps. If you are not following the guide exactly you need to investigate what extra steps will be needed. I suggest a search of forums such as Insanelymac or Infinitemac for available guides, I read several before starting my install to decide which method I preferred, and also which method looked to be the most promising. I’m not sure how important the UUID change is, there still appears to be differing opinions of this. It’s not necessary to be booted into Snow Leopard to change the UUID in the PlatformUUID.kext and AppleSMBIOS.kext packages, this can be done from the existing Leopard installation. 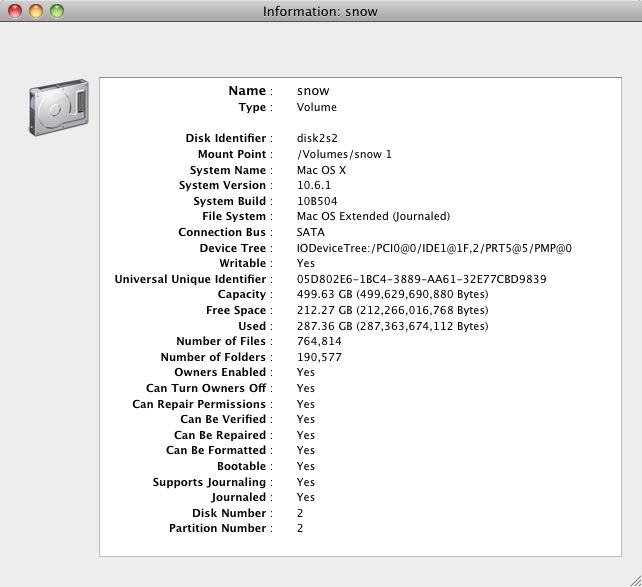 Disk Utility will still show the UUID for the Snow Leopard partition. Since writing this guide I have made some further discoveries such as removing the AppleSMBIOS.kext didn’t appear to make any difference. When I get a chance I will write a follow up about the small problems and fixes I have since found. I also read the blog of http://www.solobasssteve.com/ and, although I know you and two and your blogs are different, mixed you up! Thanks for the detailed reply, appreciated. I’ll adjust my install accordingly. I’m very comfortable on the command line. In retrospect I went around the loop several times – and because I never completed the install Snow Leopard – the EFI partition never became ready to be mounted. Because I’d read that SL doesn’t actually use the EFI partition I assumed that it was Chameleon, rather than SL, that formatted it. I suppose Chameleon, not seeing the EFI partition formatted it wrote its files to my SL partition. In terms of kexts, it would be great if Chameleon had a way to select what motherboard and other hardward it was being used for, and just did “the right thing”. I’m sure that will come. In the meantime, thanks, Basshead, for your posts, and your detailed followup. Gigabyte P35-DS3R here with an 8800GT. Mine gets stuck on ‘Waiting for boot volume with UUID….’ on a 1.5TB SATA Seagate. Any ideas? Followed your guide and others to the letter. hi paul thanks for your great tutorial. its the best one i’ve seen and conveniently suits my hardware but i’m having a few teething troubles. as i dont have a pc with working leopard install i’m trying to run this procedure from a macbook pro to create a bootable SL drive (using a usb enclosure) to put into my PC which has essentially the same spec as yours apart from a 512mb 8600GT. I have become stuck at the point where i run the chameleon app after SL installation. If I run chameleon from within my macbook’s SL install it fails to complete, crashing out at the ‘moving files’ stage. chameleon runs if booting the new external SL install but I guess that it would not boot if i was trying to do this from a hack. 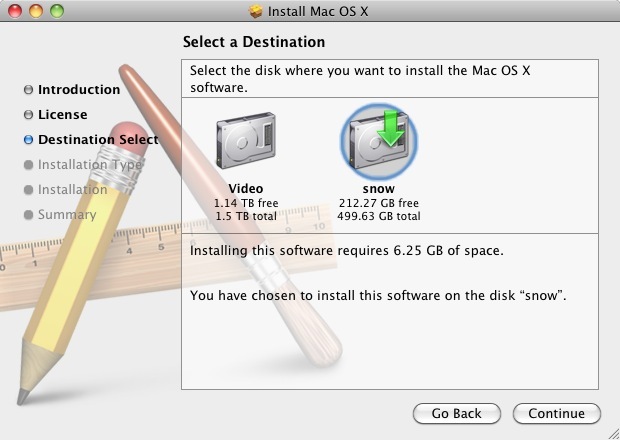 In Reply to Stra, I have seen mention of problems with Leopard/Snow Leopard on a partition larger than one gigabyte. 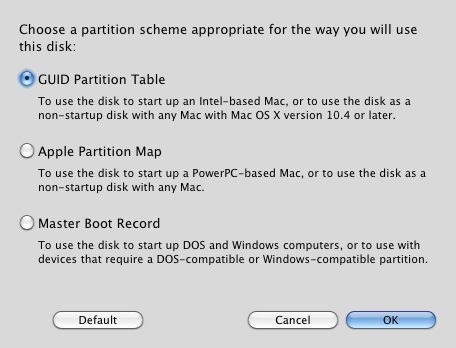 The solution suggested was to create two partitions, one under a gigabyte for the OS and the rest as a second partition for whatever you want. 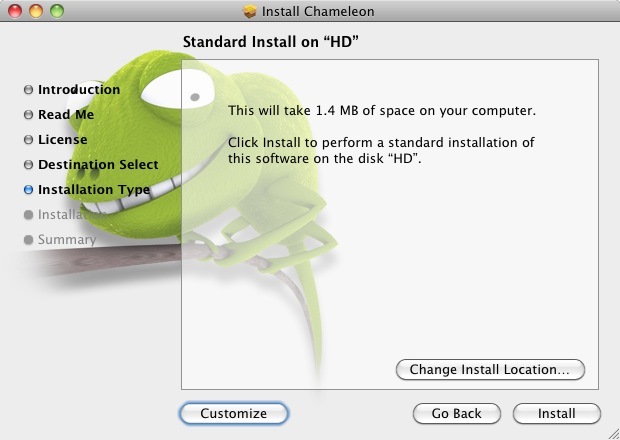 Thom, I haven’t tried installing Chameleon to an external drive from my Macbook so I can’t help much with your problem. If I get time I will have a go and post the result. Any advice on getting this darned thing to mount so I can finish my install? I also had problem mounting the darn EFI partition. Regardless of what I tried it always came back with the annoying “mount_hfs: Invalid argument”. Hi Paul — I must add my thanks for a very clear and helpful guide. I have been running vanilla Leopard on my GA-EP35-DS4 system, following a guide that provide a script to install needed kexts. 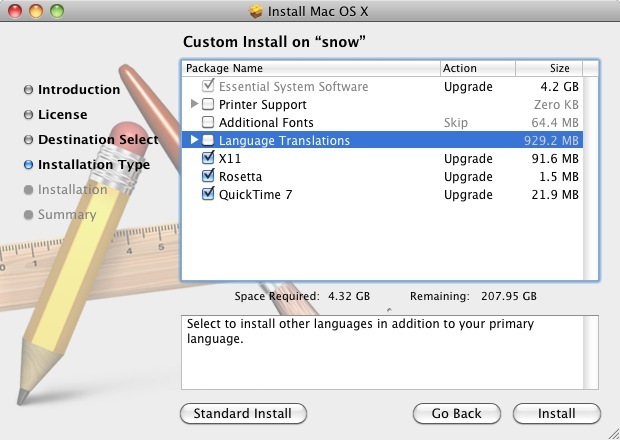 But I have never had any luck installing Snow Leopard, following various guides. So I tried yours, with a dsdt.aml from AsereBLN on the EFI-X Users forum for my motherboard and BIOs version. I used a com.apple.Boot.plist, but I didn’t use an AppleSMBIOS.kext or a modified PlatformUUID.kext. I googled this error a bit and saw one post from a guy who got that fault related to JMicronATA, but other aspects of his panic were more specific than mine. I know this is probably an ill-defined problem, but can you suggest where I could start looking for a solution? Hi I am trying to get the “restart after power failure” which doesn’t show in 10.6. Paul, great guide as always (I’ve read your hackintosh posts since I first got in to it). I’m having quite a bit of trouble getting my audio to work though. I’ve got the same MB (earlier rev though, 1.1) and the ALC889a audio. I tried following the guide on insanelymac you linked to but no luck. There is no “Name (BUFA, ResourceTemplate ()” line in my DSDT … I have a Device (HDEF) section, but it is at the very end of the DSDT. I tried just pasting in the code from the insanelymac guide all the way to the end (adding a few ‘}’ to avoid syntax errors) but that didn’t work either. Would the DSDT be that different for 1.1 and 2.1 even though we have the same ALC889a? Or maybe I’m cutting off something at the end … I really have no idea here as I feel a little out of my league editing the DSDT. Any help or suggestions you could give would be a big help. Got stuck at the terminal point where there was an “invalid argument”. As there is not reply to solve this problem this tuitorial has proved pointless for me after many retries. I hope it works for others. Try changing your BIOS setting for SATA to Native SATA (or ACHI or just SATA) as opposed to IDE emulation. This is what worked for me. Hi all. I decided to buy a Window laptop which has i5 processor. 4gb of ram. Can I know which laptop would you recommend to make my laptop hackintosh dual boot with window 7. What else must I look out when buying the laptop ? specs i mean. The purpose for installing mac os because I need logic pro to work it. That’s all. Other than that. Nothing because I use windows for most of my everyday use . But you never know that I will get hook up using mac os. I have a few question. Does the laptop keyboard works? Like apple c to copy ? All those shortcut keys. How can I use that with the new laptop that I’m planning to buy? Meaning I’ve to do control c on hackintosh? I heard audio don’t work at times as well as wifi. Is there any fix? I have a copy of osx retail DVD. Fine with it? And also what about the drivers? Where can I find for hackintosh? I’m confused but thanks again. I must have a Sata drive too? Hope you guys can find me a good laptop. Ard 1k. I do audio and video editing . Thanks! Thanks for your guide. However all guides require a MAC to work on, but I don’t have any. Is there anyway we could make a new ISO on PC? I have installed on my pc, and succes. but when I restarted i get blank screen. Thanks for the amazing explanation regarding the steps to install.. I also read your second method. 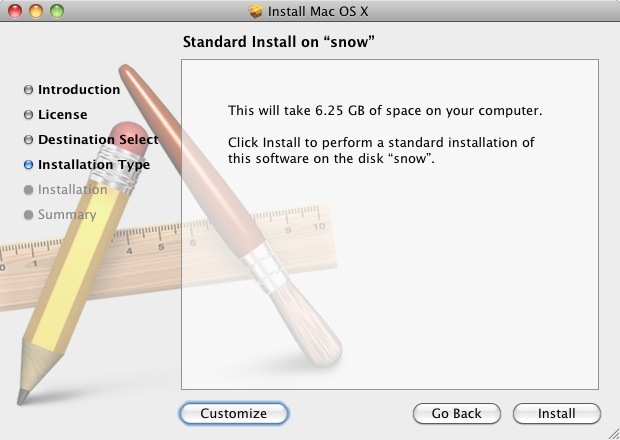 I would like to install snow leopard on my g5 desktop. But of course it will only run on machines with Intel processors. My biggest issue is that I enjoy using my Macs, but I am not a technical expert. But I am the ( I’ve got to try this trial and error type of Person ). For instance, I won’t try some of this stuff because I don’t have a clue what Hackintosh is or how to get it. I like what you guys are up too. This kind oof clever work and reporting!